Happy Friday! I am poping here quickly to share a very fun project while attending Creativation 2019. If you are in Pheonix, AZ this weekend, make sure to come on by our booth at 461 and say hi! Would love to see you and give you a big hug! Today we are celebrating a very special occasion. One of the things I do for Altenew as their Operations Director is being a part of Altenew Education Certification Program. 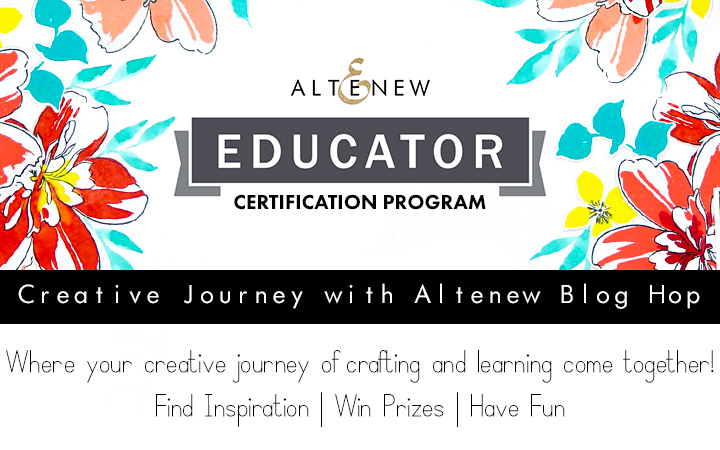 This program was launched in late 2017 to help fellow crafters improve their cardmaking/paper crafting skill set and provide ways for them to be more involved with and spreading the love of Altenew. 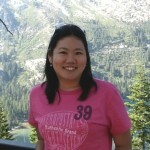 I work closely with the amazing AECP Coordinator Virginia Lu and have been witnessing fellow crafters becoming wonderful certified educators. They hold workshops, demos, and share the love of Altenew products with their community. It is truly a blessing to have worked with them. If you have not checked out the program, I highly recommend you do so! Find more about AECP program HERE. Today we are celebrating all of the currently certified educators by having a very special blog hop! I am just honored to even be a part of the hop. So let’s get right to it. I am going to share a project created by using Artist Mark Refills and have a video tutorial below for you to check out. Hope you enjoy! Many of us love to get messy with alcohol inks – but did you know you can also use your Artist Marker Refills to get the effect you can get from any other alcohol inks? This is a great way to get more use out of your refills! I chose 4 colors to use on this card, Blush, Rouge, Crimson, and Velvet. These are refills for the Red Sunset marker set with beautiful peach to bright red color shades. So I added a bunch of drops to a peice of yupo paper to create a very fun background. You can add layers on top of layers to create an effect you like. Don’t you just love the blended colors and the textures they created? You can speed up the drying process with a heat tool, or air dry it for a couple of hours. For the sentiment, I used Gold Foil paper and cut out “Hello” using the Caps Bold Alphabet Die Set. After popping them out using some foam squares, I added the “beautiful” stamped greeting from the Meadow Flower Stamp Set. I kept the rest of the card very simple since the background itself is the start of the card today. I hope you enjoyed the project! Thank you for stopping by, and dont forget to enter the giveaways (info listed below)! Altenew is giving away THREE $30 gift certificates to Altenew store! Make sure to visit their blog and leave a comment to win. I am giving away $15 gift certificate to Altenew store! Please leave me a comment below by January 21st, 11:59pm PST. I will post a winner here on the 22nd. Good luck!! Congrats, Elizabeth! You are the lucky winner of this giveaway! 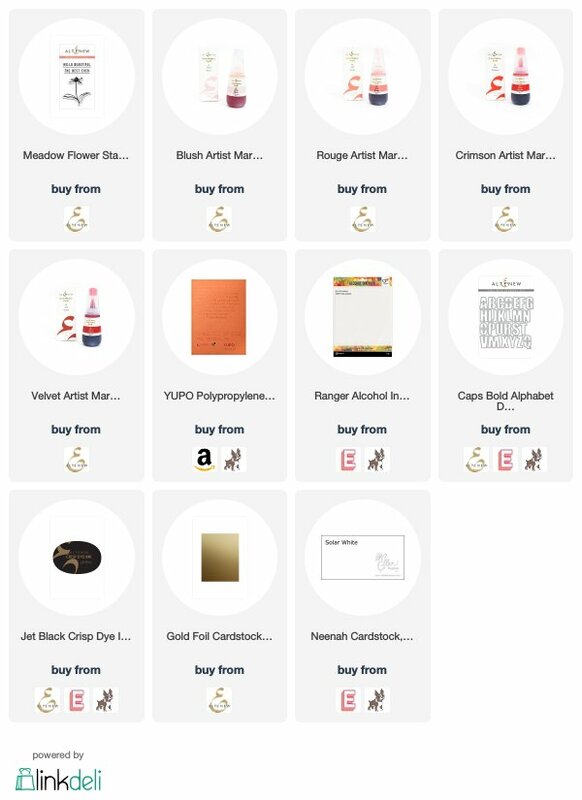 Please contact Altenew at winner@altenew.com by 1/31/2019 with the subject line Altenew Educator’s Blog Hop Winner from Nicole’s Blog to redeem your prize. Thank you for leaving me a lovely comment!! I am the last stop of today’s blog hop! You can visit the Altenew Card Blog to check out other stops of the hop and enjoy the inspirations. Excellent use of color and ink refills. Gorgeous card as always! Love the idea of the AECP – hope to participate one day! beautiful card, Nicole – love the background you created with the gold letters – wish I was in Phoenix with you – it’s freezing here in Nebraska!! Thank you so much for sharing this! I didn’t think the refills would be necessary for me, but seeing this video, they totally are! Gorgeous brilliant colour – a really nice backdrop for the bold font of the sentiment. Beautiful card!! I love making backgrounds and adding a large sentiment!! I love alcohol ink backgrounds!! Yours is gorgeous. I didn’t think to use Altenew’s reinkers but I will definitely give them a try!! 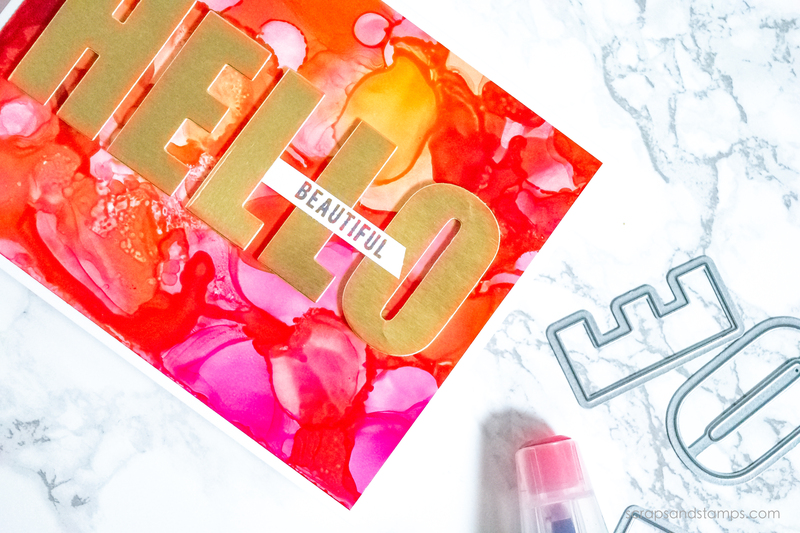 Great card – love the colors you used together. My new favorite combo! I laughed when you said you didn’t use alcohol inks much because you didn’t like the mess. That is exactly why I haven’t used them at all yet. But you make it look so darn easy I may just break down and buy some to try. Love your card Nicole!!! Thanks for sharing your talent with us. Beautiful card and great technique! Congratulations on qualifying as an Altenew Educator. Your card is absolutely lovely! Gorgeous card! I love the alcohol ink background! The colors are beautiful! Stunning card Nicole! I love the vibrant color and simple sentiment embellishment. Nicole, I always learn so much from you. I just recently received my Altenew Alcohol Markers and hope to get some refills to try this beautiful background. Thank you for your videos. It’s amazing all the possibilities you can get with these ink refills. Your card is very pretty! Have fun this weekend. I’m loving this background. The sentiment and background just play along so well together! I love your rich bright colors! Thanks for the great video too! Nicole – SO glad you were able to join in the hop. It has been great having you as part of the program! Yea! We did it. The program is very successful and can only be if the people behind it (you, Virginia, Altenew) are 100% committed -and you are. Thank you so very much. Gorgeous background with the gold sentiment!! Very creative. Your card is beautifully crafted, and I love the gold accent in front of the lovely background. Gorgeous card. I have seen some of your work on Altenew before and as always it is beautiful. Thanks for the inspiration. So very vivid and bold! You held back nothing with this card and its amazingly awesome in its creation! Such a pretty card! The background looks wonderful. This is a great technique. I always get messy when I use inks, no matter how careful I am. I’m very thankful for the Tim Holtz scrubbiest. The gold foil looks beautiful against those reds. Wow! This card is stunning! I have really enjoyed the blog hop. It is great getting to know the crafters who have completed the AECP a bit better. Looking forward to joining their ranks very soon! This i s my kind of card, love the colors and the gold just makes it look so elegant. Love the gold sentiment against that pretty background. OMGosh that background is beautiful. Thanks for sharing. Love your card! The alcohol background is beautiful! Thanks for the inspiration! Beautiful. Beautiful. You got perfect background colors! I really like the big bold letters. Fun technique for an alternate use of ink refills. Thanks for sharing. Beautiful card, Nicole! Love the bright background! You have inspired me to go play with some refills!! Thanks! Love the background you created. Stunningly beautiful. TFS. Really like the background design you used with your cards. Very creative. What a beautiful card. I’ve been on the fence about trying alcohol inks, you are inspiring. Thank you for sharing. I love the colorful background and your use of fold foil block letters. Great idea to use the reinkers this way! I love how the colors play together on the Yupo paper. And you can never go wrong with the bod alphabets. 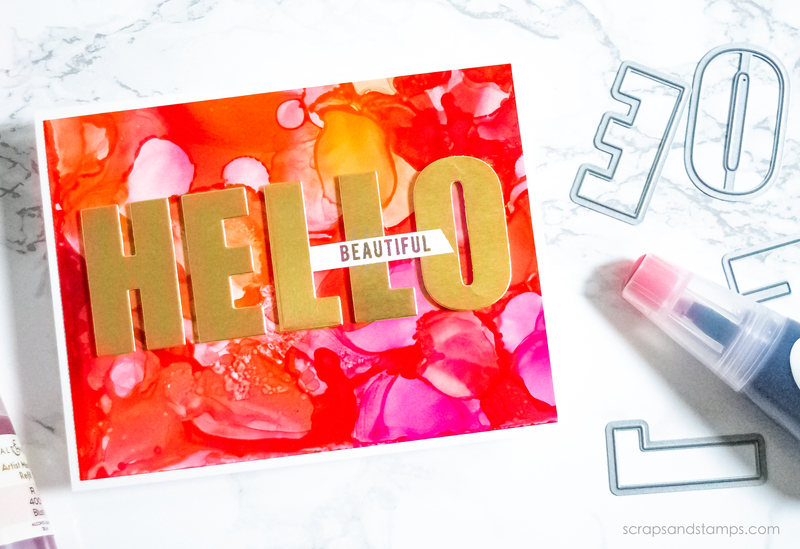 Gorgeous card with a beautiful color combo! love that alpha set! Love the vibrant colors in the background! Oh, lovely card! The gold letters with the free spirited background is very creative. Thanks for doing the video! Cool background and I like the gold letters. I especially like your choice of gold letters to go with the “hot” background! 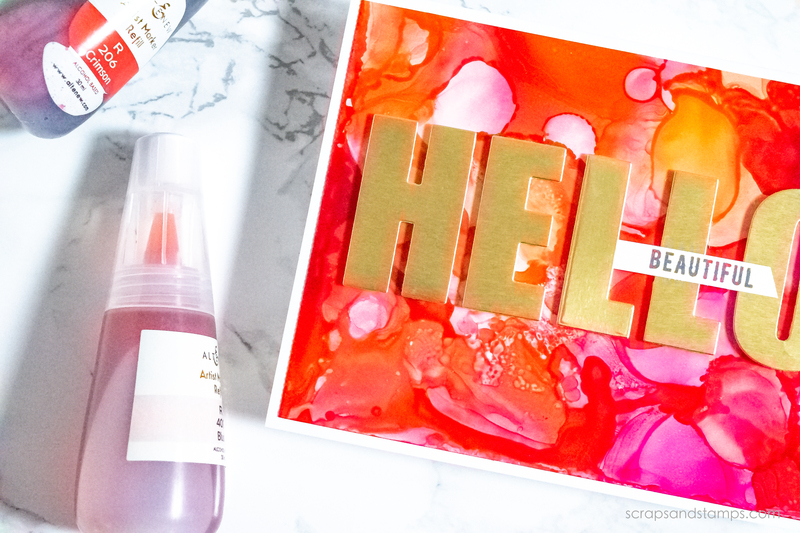 Love how you blended the Alcohol Inks, my kind of colours and such a bright and bold card. Thanks for sharing! WOW Nicole, how stunning! These colours of alcohol inks are so rich and vibrant and look amazing with the gold lettering. Thanks so much for sharing this. Simply stunning! Love your background and the pretty colors. Beautiful card! I should try the technique that you showed. Congrats on being an Altenew Educator! 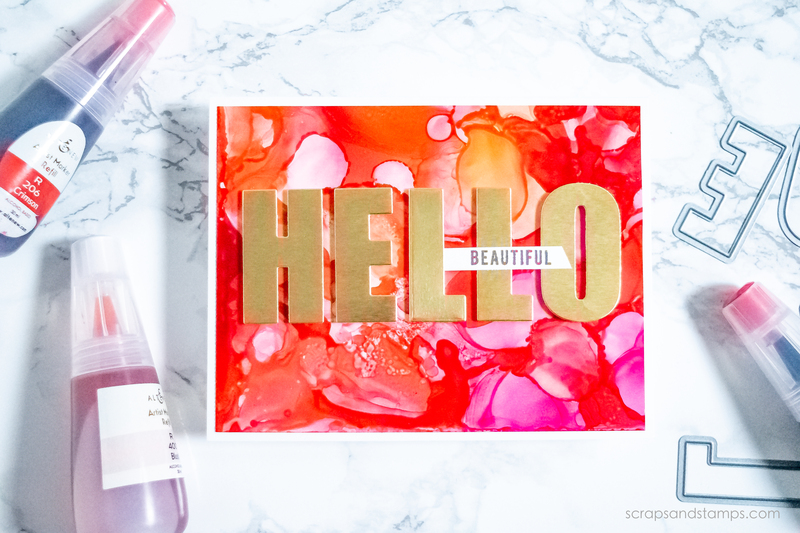 Gorgeous alcohol ink background and I love the bold HELLO! Ha ha…..I get messy with ink pens! You were pretty neat with these inks! Love the colors and swirls and dimension you achieved with these bold colors, and the gold bold letters make a great topping. Thanks for sharing some wonderful tips today! Beautiful card, Nicole! I enjoy seeing your work. It is always beautiful. Your background is amazing. I love playing with alcohol inks, but it never occurred to me I could use Artist Marker refills. Beautiful card. What a great idea to use the refills instead of having to buy alcohol inks too!!! Congratulations on the success of the AECP Nicole! Love your alcohol reinkers background! I hope to be part of this program this year! Thanks for the inspiration and for the giveaway! The colors of the card are so dynamic. Beautiful! Thanks for sharing! Gorgeous work!! Am your avid fan and LOVE your work!!! Oh my! What a beautiful card with alcohol marker refills. Love those happy colors and the big hello! Your card is beautiful and so fun. Thank you for sharing. Such a vibtant card, Nicole!!! I love all the colors!!! What a way to end the blog hop. I do love the look of Alcohol Inks and your background is gorgeous, I love the colors you used!! Note to self: start buying Artist Marker’s and Refills lol. They really are on the top of my “must have” list this year and I can’t wait to try the markers. Thanks for sharing your very cool card and for the inspiration to get busy (buying and creating :)). Nice background ! I will need to try that! Thank you for sharing your techniques with us! The background on this card is breathtaking! I love the ink on Yupo effect. Thank you for sharing. Fabulous background! I love the use of the ink refills on here!